Tocarry I'ofnibn Waodui/rlting in your «ore, cull Sieve I lud:iak .,t 800-894-4656 or write Magazine Retail Sol». Steve Hmhuk, P.O. Box 5014. Iota. Wl 54945-5014. liack tfsueaare available tor $7 I$9 Canada; $11 other tureijin). Send check or money order to; Popular \X'oixiu*>rlimn Back l»ues, R*W I'uMk.tnom Product». 70C E State St., lola, Wl 54990. Or call S00-258-0929. Ilease specify publication, month and year. Safety is yow responsibility. Manufacturers place safety devices on their equipment for a reason. In many photos you see in Popular Woodworking. these have been removed to provide clarity. In some cases we'll use an awkward body position so you can better see what's being demonstrated. Don't copy us.Think about each procedure you're aoina to oerform beforehand. Safety First! Troy Sexton designs and builds custom furniture in Sunbury, Ohio, for his company. Sexton Classic American Furniture. Troy is a contributing editor for Populär Woodworking. 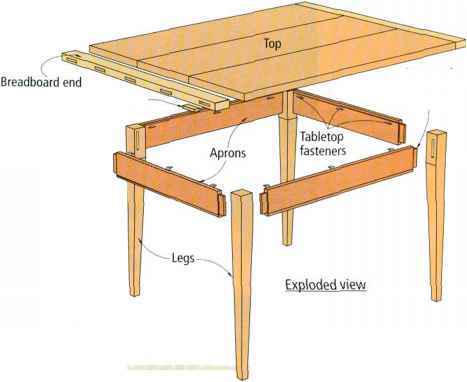 Build almost any table you please with these tried-and-true construction methods. 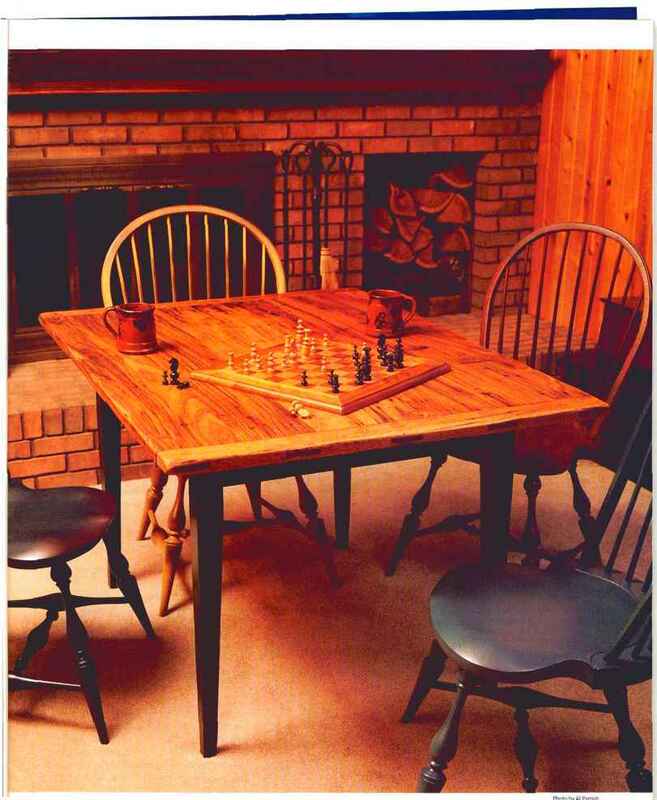 We used ro have a table just like this one that was great for playing cards or board games with our two kids. Unfortunately, I sold that table and have always regretted it. So when we finished out a couple of new basement rooms for the kids, building a new game table was first on my list. The top of this table is made from three boards of wormy chestnut, a species of wood that you're going to have to hunt for. 1 bought mine from a wholesaler who bought it out of a barn in the Smokies. And it was expensive: about $10a board foot. The painted base is made from poplar. There are a lot of ways you can join the aprons to the legs, from totally traditional to quick-ar\d-Jirty. I prefer using a straight mortise-and-tenon joint, though if 1 were building a little side table or something else that wouldn't see daily abuse, rhe two less traditional methods I'm going to cover would work just fine. Rut before we talk about the bases, let's build the top. After I pulled the right boards from my woodpile, 1 got them ready tor glue-up. 1 wanted this top to look rustic, so I didn't plane the lumber. Instead, 1 jointed rhe edges of the planks and glued up the top. Then 1 rough-sanded it with a belt sander to get ir reasonably flar and to remove some of the milling marks. Then 1 cut the top to size and worked on the breadboard ends. 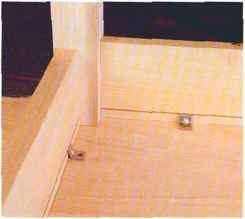 For a long rime 1 used traditional through-mortises to attach breadboards to cover the end grain of my tabletops. Other people showed me how to do it with slotted screw holes. I always was against using that method until 1 actually tried it. Now it's the only way I'll attach breadboards. You actually get less up-and-down movement using screws, and the top stays flatter-looking longer. Here's how I make my breadboard ends. After cutting the breadboards to size, cut 3/&"-wide by 2'/¿"-long by 1 '/¿"-deep mortises in the breadboards. 1 cut five mortises for my 36"-wide top. However many you use, it's good practice ro have an odd number of mortises so it's easier ro lay them out. I put the two outside mortises /l" in from rhe end of rhe breadboard. The plugs for the breadboard ends ate made from the same material as the tabletop. Sand the plug to fit, put some glue on the sides and tap it in place. from boring a hole into one of my screws accidentally. Don't drive the screws in too tightly. You want the tabletop to be able to move. I cut the mortises' plugs to fir the opening and taper them a bit so they fit snugly when rapped in place. Glue the plugs in place, then peg the plugs through the top with l'V x W" square pegs. Now age rhe top. I strike the top with a key ring hill of keys; I even write people's names in the top with ,1 Unite. It's pretty amusing to watch people as they see me do this. They freak out. Finally, it's time to finish the top. Stain it with a golden oak color and then add a natural oil finish, such as Warco, which is an oil/varnish blend. You don't want it to look too shiny. Now you can turn your attention to the base. I usually build my tables using straight mortise-and-tenon joinery (above). However, there are special cases when other methods are just as good or even better. These tabletop fasteners are cheap ($1.99 for a pack of eight) and sturdy. Simply place the clip end into the kerf in your apron and screw the other end to your tabletop. This is a traditional method and it's what I prefer. First cut your aprons to size. Cut 1 "-long tenons that are 'V thick. The apron lengths in the cutting list below the illustration at ri«hr include the tenons. I cut my tenons first and use rhem to lay out my mortises, which results in less layout. These aprons are set back '/»" from the front of the legs and are called, naturally, "set backs." 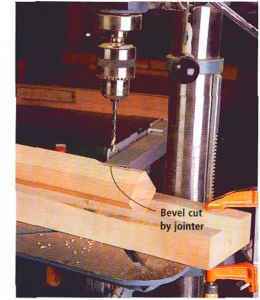 Now cut a bead on the bottom edge of the aprons using a beading bit in your router. Then, cut a slot on the inside of the aprons for fastening the base to the top. I use metal tabletop fasteners from Rockier (see the supplies list ar right). For these fasteners, the slot needs to be the width of your table saw's blade ('/s" ora bit less), 'At" down from the top of the apron and V' deep. Now it's time to glue up your base, peg the mortises through the legs and finish the base. 1 use square pegs in my legs. First drill a round hole through the leg and into the mortise. Then take a piece of square stock and whittle one end of it roundish. Add some glue and then pound the peg into the hole. The square pegs should convert your round hole into a square one. This method is similar to the straight mortise-and-tenon method, but with this you must miter rhe ends of the tenons because your mortises meet in rhe middle of the leg. Why would the mortises meet? Well, you might have a thinner leg, or your mortises might be back (aether if you chose to use a larger set back. When this is the case, I make a standard tenon and chop the end off at a 45° angle on my miter saw. You're not trying to match the two miters exactly (it will never show) so leave a little gap between the two tenons. If it's too tight, it will get you in trouble because the ends of the tenons will touch before the shoulders sear into the legs. I wouldn't recommend using these for a large table. If you're going to spend the money on quality wood, you might as well use a traditional joinery method. But if you want to build a quick-and-dirty side table, pocket screws will work fine. Be sure to glue and screw this joint fi >r added strength. It's very important to keep the pieces tightly together as you screw the apron to the leg to avoid any gapping at the joint. No matter which method you use to build your table, there are a few rules you must follow when designing it. Otherwise your family and guests will be uncomfortable, they'll ram into each other or they'll bang their knees on your aprons. You don't have a lot of room to wiggle here. Make sure your table height falls between 28'/j" and 30". A few sources say 32" is OK, but 30" or less is more common. Make sure each of your sitters has at least 24" of room between the bottom of the apron and the floor. This means that a 30"-high table with a '/«"-thick top should have aprons no wider than 5Vs". The distance from the edge of the top to the apron can vary. Between 10" and 18" is great, if possible. The amount of tabletop allowed for each place setting should be no less than 23". A roomier table will have 28" to 30". The standard width is between 30" and 34". A square table for four should be about 40" x 40". Six can be accommodated by a 60" x 30" top. To seat four, make your top 44" in diameter (34V2" of edge space per person). To seat six people, make it 54" in diameter (28V4" per person). "Illustrated Cabinetmaking" by Bill Hylton, Reader's Digest, Pleasantville, N.Y.
"MeasureTwice, Cut Once" by JimTolpin, Popular Woodworking Books, Cincinnati. 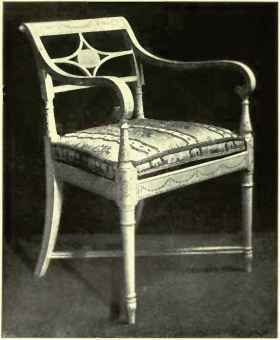 "Encyclopedia of Furniture Making" by Ernest Joyce, Sterling Publishing Co. Inc., New York. "Cabinetmaking and Millwork" by John L. Feirer, Bennett Publishing Co., Peoria, III. 34215, $1.99/pack of 8 Prices as of publication deadline. When you have to use mitered mortise-and-tenon joinery, don't get too worked up about the fit of the miter. You don't want it too tight. Mitered mortise-and-tenon joinery is common on tables with thin legs or when your set back is deeper than normal. For pocket screws, glue the joint and hold the leg and apron together tightly while screwing it together. Pocket screws aren't my first choice for building dining tables, but they'll work for an occasional table. These are a faster alternative to traditional joinery, but they aren't as sturdy. However, you can't hear them when you want to make a table that can be knocked down and stored away - perfect for those who don't have much room. These measurements apply to the brackets from Rockier (see the supplies list on rhe previous page). The first step to installing these brackets is to cut a bevel on the inside corner of the legs. This is where you'll later install the hanger bolts. The best way to cut rhe bevel is on your jointer. Set the machine's fence to a 45° angle and the depth of cut to V', Cut 3 /2" in on the top corner as shown in the photo ar right. Now it's time ro install the hanger liolrs. Hanger bolts are odd-looking fasteners that have wood-screw threads on one end and machine-screw threads on the other. The wood-screw end goes into the leg, and the machine-screw end is bolted to the corner bracket. To install the hanger bolts, first lay out and drill pilot holes on the leg. Then install rhe bolts. Now you need to cut a kerf in each apron for the bracket ro grab. The kerf shou Id be l3/4" in from the end and 3/s" deep for these brackets. Different brands can use different measurements. I attach the top with tabletop fasteners that I screw in place about every 12". On the long aprons, don't push the fasteners all the way into the kerf when screwing them down. This will give your top some room to move. Corner brackets are great for building furniture that needs to be disassembled or moved frequently. Use the bracket as a template for locating the holes for the corner bracket. Then use your drill press to make your pilot holes. To install the hanger bolts, thread two machine nuts onto the end of the hanger bolt and tighten them against one another. Then grip the two nuts with a wrench and screw the hanger bolts into the leg. Now I'm beginning the second pass. I've turned the leg around and "popped a wheelie" using my pusher-holddown block. Advance slowly and steadily into the cutterhead. Now I'm near the end of the second pass. The outfeed table supports the tapered side after it comes off the cutterhead so the leg moves steadily over the jointer beds as long as I keep firm pressure on the pusher-holddown block. Here I'm making the first pass on the leg. My jointer is set to make a V-deep cut. As soon as the cutterhead reaches the mark at 1V, pull the leg up off the jointer. 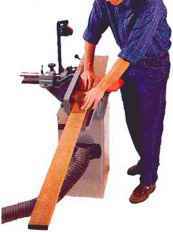 For years I used a tapering jig on my table saw to cut tapers on legs. Even after cutting hundreds of them, I never liked using the jig. It felt unsafe and always brought my fingers too close to the blade. One day this method came to me out of the blue. It works so well and so fast that I'm still kicking myself for not thinking of it sooner. 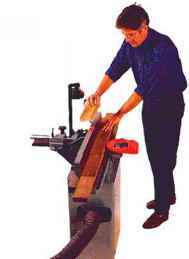 The method uses your jointer and can cut just about any taper in only two quick passes. Now turn the leg around so the top part is headed towards the cutterhead. Place your pusher-holddown block on the bottom of the leg and push down so you "pop a wheelie" with the leg. Slowly push the leg into the cutterhead while pushing down and forward on your pusher-holddown block. When you finish this pass you will have a perfectly tapered leg on one side. half and forget about the fraction - so you get 11". Make a mark on the leg that's 11" up from the bottom. 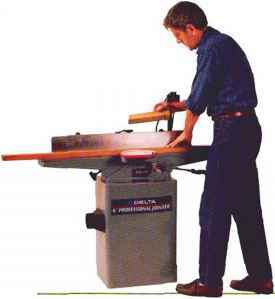 To reduce the width of the leg at the floor by half (which is standard with leg tapering), set your jointer to make a V2"-deep cut. 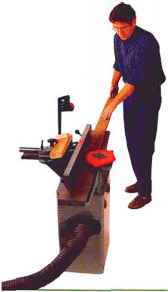 Now make your first pass on the jointer by slowly pushing the leg into the cutterhead - foot first - until you reach the mark at 11 ".Then lift the leg off the jointer. 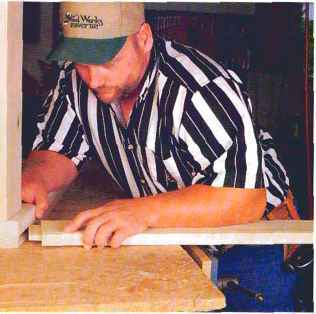 Knowing the right way to face joint your wood is the first step to a trouble-free project. Comments or questions? Contact Steve at 513-531-2690 ext. 1238 or [email protected]. 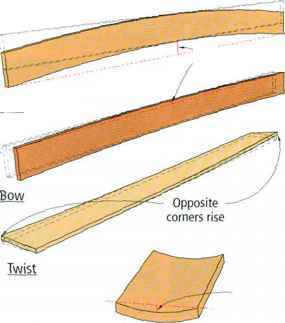 The jointer's primary function is to flatten rough stock by removing cups, warps and twists on the wide dimension (or (ace) of the lumber, and to straighten an edge hy removing any warp or bow. (For a lesson in edge jointing, see page 63.) Starting a project with lumber that is straight and flat with consistent thickness is fundamental to building furniture. When selecting the face to joint on any rough hoard, look for cups, warps and twists- For cupped or warped boards, joint the face so that the cupped or warped side (concave) is down. This reduces the chance the board will rock on the infeed or outfeed table as it moves over the curterhead. The flat surface you create on the first jointer pass must remain on the same plane during every pass to achieve a truly flat board. Cutting with the grain terhead and lock u in place. 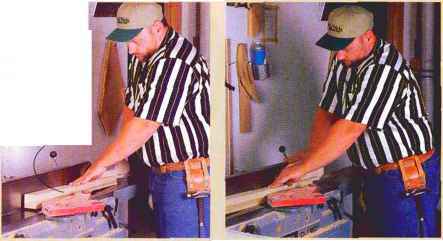 To determine which way rhe board should go through rhe jointer, read its grain direction (see the illustration above). See the photos at right for srep-by-step instruction. Note that with boards more than 3' long you'll need to change foot position during each pass. Because you are standing with your right foot nearly perpendicular to the table and your left toot skewed slightly outward, foot move ment should be in a shuffling motion. Never take steps by crossing your legs. Some hoards require only one pass before they are ready to plane, others need several. The objective of face jointing is not to smooth rhe entire bottom surface, but to flarten it to the point where it can maintain a parallel plane relative to the planer's cutterhead knives in the next operation. The board is ready for the planer when there is enough flattened surface along the width and length of the board to prevent the planer's feed rollers from pushing the face-jointed surface out of parallel wirh rhe planer knives. Rock the board on the jointer table across its width to find the flattest area, then maintain this plane as you begin the cut. Stand near the back of the board and do not use any downward pressure on the board. Use your left hand to keep the board against the fence and use your right hand to move the board forward and in the correct plane. Let the force of the cutterhead in the wood keep the board down on the outfeed table. 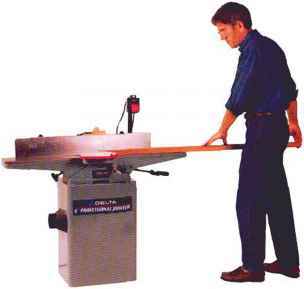 Keep your body positioned as shown until the board is fully supported on the jointer tables. With the board supported, move toward the cutterhead by taking shuffling steps with your feet. Again, your left hand keeps the board to the fence and applies only enough downward force to control the stock. Use a shuffling motion to move your hands and always keep one hand on the board. When your left hand is about 18" from the cutterhead, pause, and while keeping firm control of the stock, reach for the push block with your right hand, then position it on the end of the board. Now continue moving the board forward. El To start the cut, stand at the rear corner of the board, supporting the back end with your right hand. Your left hand (at the center of the board) provides pressure against the fence, keeping it flush. The arrows indicate the direction I'm applying pressure. 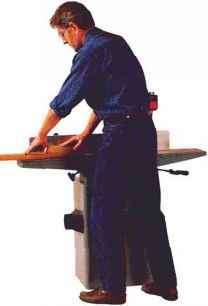 by David Thiel steP"^y-step instructions you need to make clean, safe and accurate rips on your table saw. Comments or questions? Contact David at 513-531-2690 ext. 1255 or [email protected]. Ripping a piece of solid lumber is simpler than ripping plywood, but there is more potential for danger because the stress in a solid wood board can pinch the blade when it is ripped. Roller stands are recommended (you can't see mine in these photos) and should be positioned to support both pieces coming off the saw. __Walk the board slowly into the blade, keeping the edge flush along the length of the fence. When your left hand reaches the edge of the saw's table, allow it to slide backward along the length of the board, maintaining pressure against the fence. Be sure to maintain this support until the back end of the board reaches the edge of the saw table. Grab your push stick and place it on the back edge of the piece between the blade and fence. Apply pressure forward and slightly toward the fence with the push stick as you continue the cut. Your left hand should apply only minimal guiding pressure on the fall-off piece until it's separated, then move your left hand out of the way. Once the keeper board is dear of the blade and guard, push the fall-off piece safely forward, again using the push stick. To start the cut, stand near the rear corner of the sheet, supporting the back end of the sheet with your right hand while your left hand provides pressure against the fence and presses the sheet flush to the fence. With the piece pushed up nearly to the blade, check the fit against the fence, then slowly walk the sheet into the blade.The arrows indicate the direction I'm applying pressure. As you move forward, keep your eyes on the fence to keep the sheet flush against it. As the balance of the weight of the sheet is transferred to the saw table you can shift your position to the rear of the sheet, supporting from the back but still maintaining pressure against the fence with your left hand. Continue to push the sheet forward. Pay attention to the point where the sheet contacts your roller stand (to make sure it's riding on the stand, not pushing it over), then continue the cut. 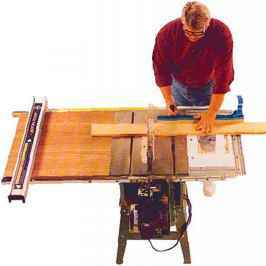 The step-by-step instructions you need to make safe and accurate crosscuts on the table saw. Guide the board into and past the blade. Km Once the board is cut through, allow the fall-off piece (on the left in the photo) to lie in place. With yout left hand, push the board away from the blade, sliding it along the gauge. Turn the saw off. Once the blade stops spinning, pull the fall-off piece away from the blade. When crosscutting a board, the substantially narrower width of the piece (and not enough width to ride adequately against the fence) causes us to use a miter gauge rather than the fence. You may note the gauge in our photos is not standard equipment. We recommend either adding a backing board at least 24" long to your miter gauge ot purchasing an afteimatket gauge. 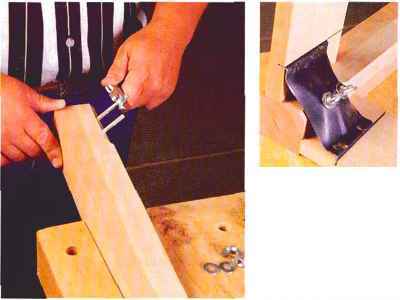 Start by ensuring your miter gauge is square to the blade. Then align your cut and pull the board against the gauge. Put one hand on the gauge's handle and the other stretched across the piece to hold your work tightly against the gauge's fence. 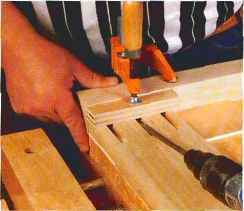 If your piece is too wide to reach across, clamp the piece against the gauge during the cut. 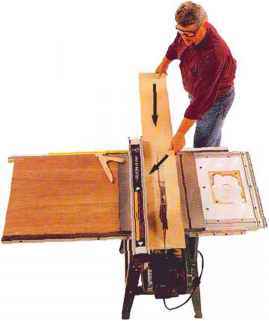 Crosscutting plywood on a contractor saw is safely accomplished by the use of roller stands. Though plywood is bulky, don't worry as much about the board pinching the blade in the cut because plywood doesn't have the internal stresses of solid wood. HI Here you see one stand positioned to one side of the table saw and another positioned at the outfeed side. When using the rip fence, do not crosscut a piece less than 18" wide or more than 48" long. There is too much chance of the board shifting and becoming pinched. Start the crosscut by standing in the center of the board to support the length. Keep your eye on the fence and keep the board tight against it. Arrows indicate the direction my hands are applying pressure. KM Maintain the center position as you push the board through the blade. Keep your eye on the fence!